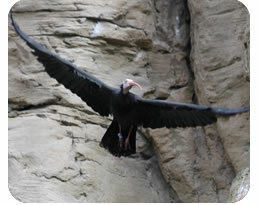 Wide use of DDT pesticide in the 1950s decimated the Waldrapp or northern bald ibis populations in Europe, North Africa and the Middle East. There may be less than 500 left in the wild and the species is part of a European captive breeding programme. Parents build a rough nest of twigs lined with grass and share care of the young, which acquire a full head of feathers before leaving the nest after around 50 days. Waldrapp ibis were revered in Egypt and known as crested ibis or crested akhbirds. Their image appears in ancient Egyptian hieroglyphs and tomb art.